The Hospital Auxiliary Thrift Shop is located in downtown Prince George on Third Street. 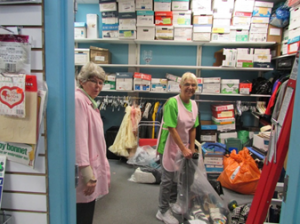 It is manned by Auxiliary Volunteers who give of their time to work in the Thrift Shop in order to help raise funds for UHNBC. The Thrift Shop accepts all kinds of donations from the public: clothing for men, women and children; household items like dishes and linens; jewellery; toys, books, and seasonal decorations are also available. Clothing is cleaned, pressed, priced and put out for sale by the volunteers. Other items are organized and priced and put on display. Many of the items donated are brand new….others are gently used. At this time we are unable to accept larger items such as furniture, appliances, or most electronics. Our customers come from all around the community knowing that the proceeds are going to a good cause. In 2013, the Thrift shop raised $90,000.00 for the hospital!! New volunteers are always welcome! Applications are available in store. Please drop in, say hello and do some great shopping! !